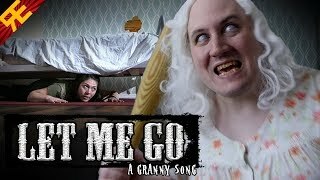 LET ME GO: A Granny Song [by Random Encounters]. Как пройти игру? Все видео пользователя: Random Encounters. but she ain't no granny of mine! because I see Granny's knees! \"Want to play hide and seek?\"
\"Come and give your Granny a kiss on the cheek!\"
and I hope she's dead. I'm sure she'll come cut off my head! What could open up Granny's door? Why is this inside Granny's drawer? I've got a shiver runnin' down my spine... Trapped here with Granny but she ain't no granny of mine! Cause her eyes are hauntingly dead and white, Teeth that oughta stay out of sight! Hair infested with fungal blight,What a fright! I could make an escape through the padlocked door... but every step that I take on this creaky floor is making horrible squeaks that I can't ignore, or Granny knows exactly where I am! Granny! Granny! elder foe! How'd I get here? I don't know! Can't we shake and make it so I can go? Let me go!. I need a hammer, and a couple keys! i need to whisper, because i see granny's knees! air so thick with her dank perfume... fog that follows her around the room. breath so close that i must assume That I'm doomed! *BOOM* She's got a keen set of ears like you won't believe! and keeps a half dozen traps up her Granny sleeve... besides a thick wooden bat to prevent my leave. I wish she'd knit a quilt or play some bridge! Granny! Granny! Right below!! She's a Hide-and-Seeking pro. Tracks you down by audio! Why, hello! Let me go! *Smack* Granny's in the hall! Calling through the walls... "Want to play hide and seek?" Gotta run! Gotta hide! Granny's planning homicide! Come and give your Granny a kiss on the cheek! GAAAAAHHHH I just shot Granny, and I hope she's dead! But if she isn't ... I'm sure she'll come cut off my head! What could open up Granny's door? Why is this inside Granny's drawer?! Where was Granny right here before on the floor?? Now I'm stuck in her house, and she's out on the prowl... with her bat in her hand and a permanent scowl on her rotted old face and she smells kinda foul, like a shambling sack of prunes! Granny! Granny! Spreading woe! Everywhere that Granny goes! Racing, chasing to and fro even though... Granny's too slow to catch me :D Granny! Granny! Well of woe!! Geriatric horror show! Might have passed on long ago! Let me go!! Let me go!!. "no" *GRANNY DYING* "I can't get anyone to stay..." "At least you'll never leave me, Mr. Muffins." *meow* "Hey!" "Get back here, you pee-stain!" if you liked this video you can check us on one of these other ones on the side, and be sure to subscribe we make a new musical! every month, if you guys want to download this song! there's a button right there and you can support us on pateron! as well, if your looking for other random encounter's merch! you can follow the link to our store below! granny salute. thank's to our pateron encounters and my special! child.. random encounters! go subscribe!